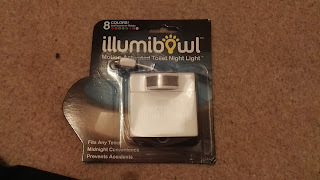 The Blog of Thog: Illumibowl - The Motion Operated Toilet Night Light! Illumibowl - The Motion Operated Toilet Night Light! Please note that I received a Illumibowl free of charge in return for this review. However, opinions are my own. So, I was checking out opportunities to review cool stuff, when I saw this picture of a happy guy who was happy because he was partnering with a motion operated toilet night light. I wanted some of that action. Illumibowl kindly obliged by sending me a sample of the world's first toilet night light! The Illumibowl is a simple but really effective gadget. Basically you pop some batteries in, stick it to your toilet, and whenever you walk into the room (and it's dark) the Illumibowl will burst into life, perfectly illuminating your toilet. It's really straightforward to use, and works really well - I've not had any trouble with it not working, or not detecting me walking in the room, or going off during the day - it just does its job perfectly. I have to say that I was a little sceptical about the Illumibowl, but when I tried it I was really impressed by how well it works - and, let's be honest, it's an awesome gadget to have! Imagine having one of these and having people round to your house one evening - don't mention it, just wait for someone to return from powdering their nose, saying "Did you know that your toilet lights up..."
To get hold of your own Illumibowl, you can buy them from Amazon here. This probably would be a very surprising thing for guests, but it looks like it is effective. The way you photographed it made the bowl look moody & scary. It sort of had a glow like the red room in the Amityville Horror. I like it. You definitely won't be stumbling around at night!